Shortly after we began finding and reporting the presence of large oil slicks in the Gulf in the vicinity of last year's Deepwater Horizon explosion, On Wings Of Care received an invitation from Captain Jonathan Burton of the US Coast Guard in Morgan City, LA to meet with them and discuss a possible collaboration for monitoring oil and other spills of hazardous substances or illegal activities in the offshore areas of the Gulf of Mexico. We had a very productive and interesting meeting together at the US Coast Guard Marine Safety Unit in Morgan City on September 13. Here are some key points from our meeting. Following these are a full transcription of our notes plus a photo gallery of presentation slides from the Coast Guard. 1. 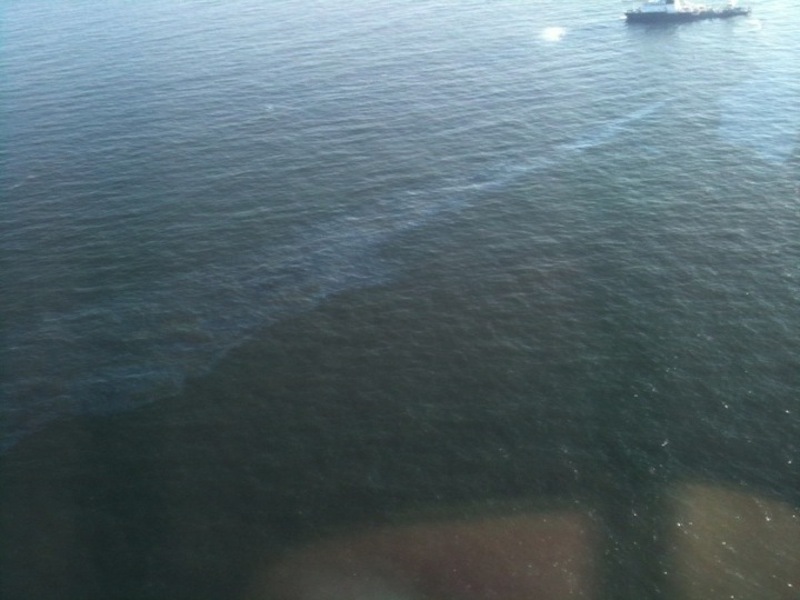 The USCG has jurisdiction over oil spill response in the offshore waters. 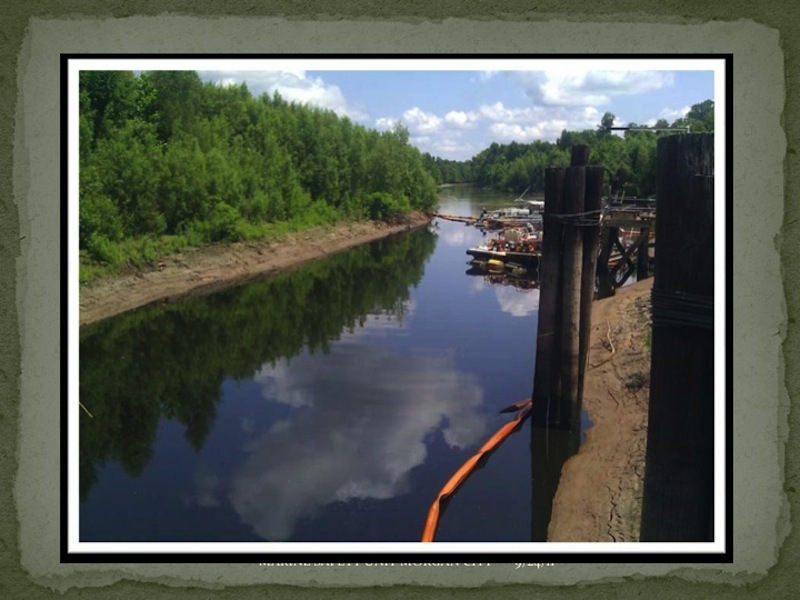 The EPA has jurisdiction over inland oil spills. Hence the continued use of the dispersant Corexit despite the EPA's statements from 2010 May discouraging its use. 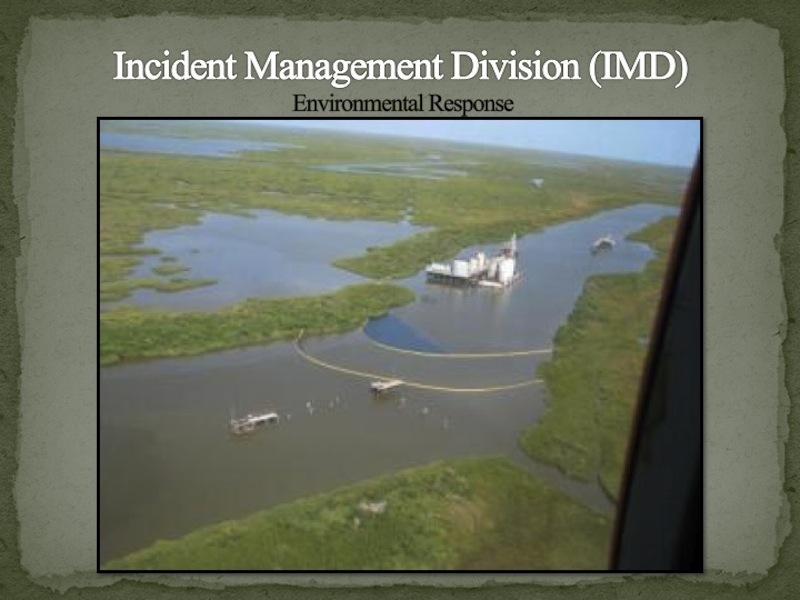 Decisions about how to handle nonrecoverable surface oil in the Gulf are made through the local Regional Response Team (#6) together with the Federal On-Scene Coordinator (FOSC,which for the Gulf waters off the coast of Louisiana is Captain Burton of Morgan City). Members of the RRT are not voted in by the public. 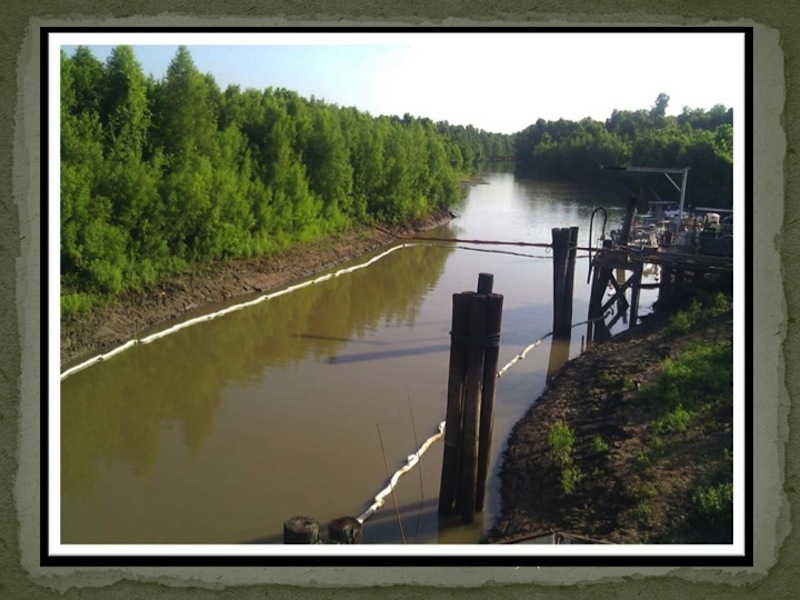 The National Contingency Plan for oil spills currently provides pre-authorization for the USCG to use Corexit on nonrecoverable surface oil in the Gulf of Mexico. If the public would like to influence that plan, e.g., to remove that pre-authorization and change it to some other preferable course of action, they must find a way to influence the RRT and the FOSC. Chances are that that will require legislative pressure from Washington -- which in turn requires pressure from public citizens on their congressional representatives. Protests alone, on the streets or in newspaper columns, won't change much very quickly, it would seem. 2. A good way to draw state and federal attention to an unacceptably high amount of uncontained oil in the Gulf is to report slicks to the National Response Center (800-424-8802). By making these reports -- and making them well (see guidelines below), not only will the local USCG respond, but all other agencies will be made aware. Companies responsible for the spill have the option to clean their "spills" up themselves or to pay the USCG to clean them up; the latter typically costs as much as three times more than cleaning it up themselves. By the Oil Spill Act of 1990, all companies must have on record a detailed containment and cleanup plan for any oil spills, as well as an acceptable plan to prevent spills. This explains in part how Nalco's association with BP changed Nalco's primary business from one of wastewater treatment to the use of Corexit as a dispersant to sink surface oil. Apparently, despite the existence of other much less toxic dispersants and oil removal mechanisms, only Corexit was pre-approved for use due to these pre-existing plans for containment and cleanup. Just who has authority to approve or disapprove these preventative and cleanup plans from the oil companies for offshore oil platforms? Not the EPA, it would seem. a. Date/time, your name/affiliation/contact information, your vessel or aircraft type. b. Location of source (if known). c. Percent coverage: -- 1%, 10%, 20%, 30%, 40%, 50%. Try at least to say sparse, moderate, dense, or solid. d. Flight path or trackline from GPS, and altitude from which observation was made. e. On-scene weather (wind, sea state, visibility) and stage of tide if known (flood, ebb, slack). -- Slick location, dimensions, orientation (N-S-E-W). If possible fly the entire slick and record the gps coordinates of the perimeter. Background: This meeting was requested by Captain Jonathan Burton, USCG, to discuss a possible collaboration with On Wings Of Care (OWOC) for monitoring oil and other hazardous spills or illegal activities in the Gulf of Mexico offshore areas. It came about as a result of OWOC's continued documentation of oil spills and help with wildlife tracking in the Gulf, in particular the recent findings of significant amounts of surface oil in the vicinity of the Deepwater Horizon incident of 2010 April. These are notes taken by Bonny Schumaker (On Wings Of Care) during and after this meeting, with additional information from a briefing by Drew Wight, MSTC. They should be compared with the Powerpoint slide package that can be downloaded here, which was presented by MSTC Drew Wight during this meeting. Slides referenced here are from that package. 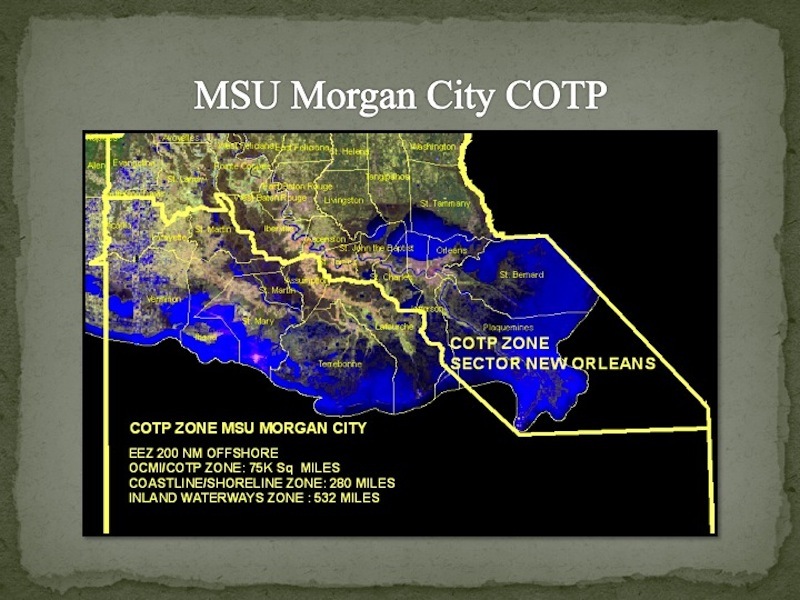 Jonathan Burton is Captain of the Port (COTP) for the Morgan City zone, which includes much of southern Louisiana and virtually all of the offshore waters (out to the 200 nm Economic Exclusion Zone) except for very close to the "Bird's Foot Delta" and around to the east, which is under the jurisdiction of the New Orleans Sector. 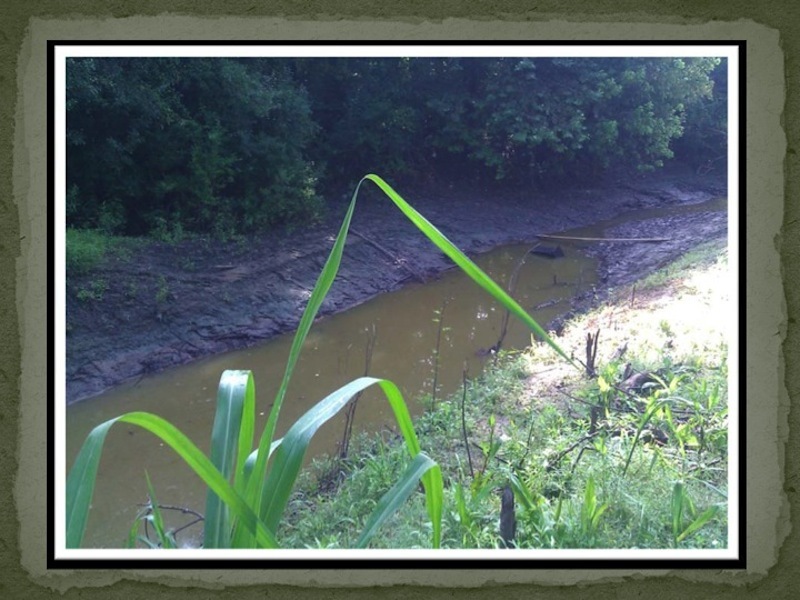 Thus, the recent surface oil findings in the Macondo Prospect, and south of Grand Isle, and even the Taylor Energy slick (most of it), fall under Morgan City's jurisdiction. West of the Morgan City zone is the Sector Houston/Galveston, and east of it is Sector Mobile. 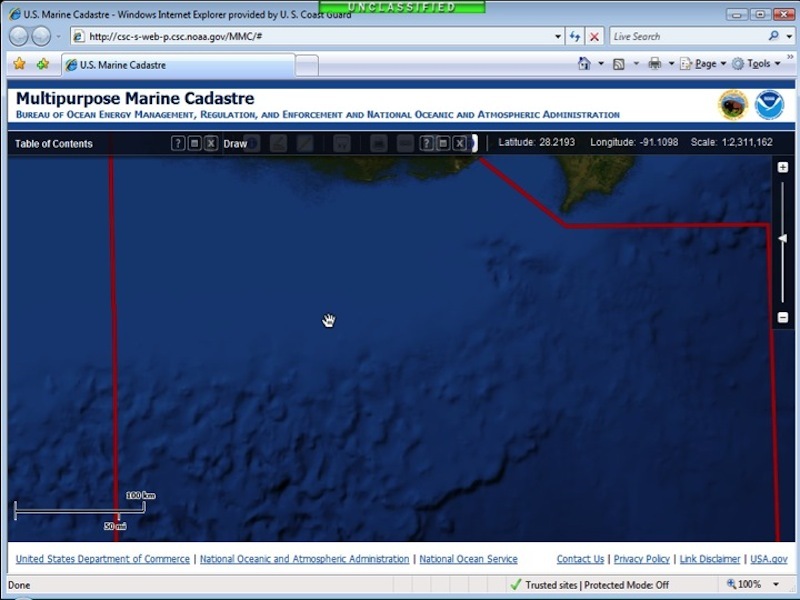 The USCG Air Command for this sector is out of Mobile. Captain Burton wears many other hats in addition to the 'big hat' of COTP. 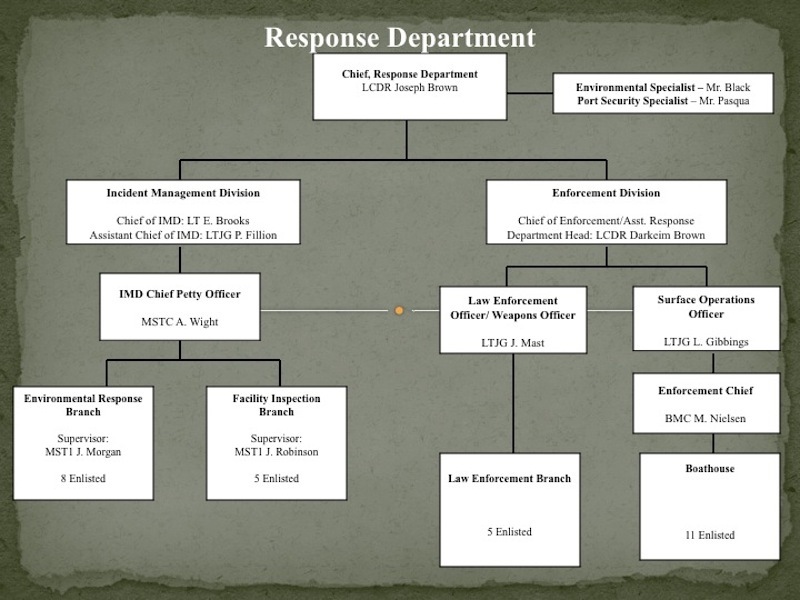 He is the Federal on-scene coordinator (for the National Contingency Plan dealing with oil spills), the Federal Marine Security Coordinator, to mention a few. 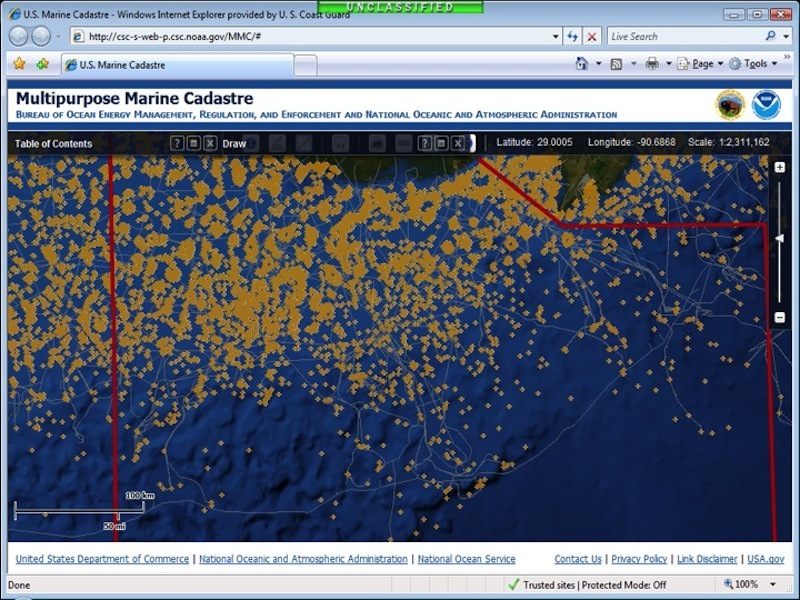 Some of the sections of the Code of Federal Regulations that apply to protection of inland, coastal, and offshore waters, wetlands, and responsibilities of the USCG include the following Titles: 10 (Energy), 14 (Aeronautics and Space), 33 (Navigation and Navigable Waters), 40 (Protection of Environment), and 46 (Shipping). 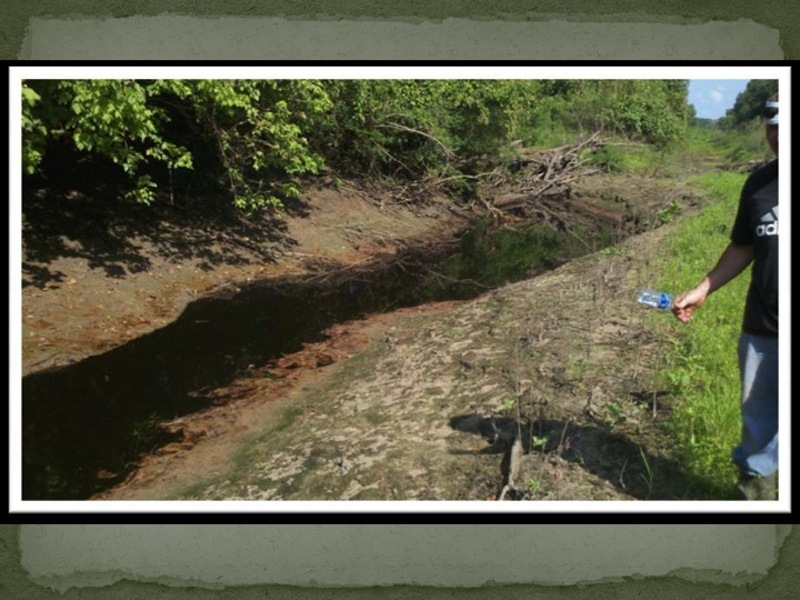 Also relevant are the Clean Water Act of 1972 with amendments and the Oil Pollution Act of 1990 (OPA90). BOEMRE (Bureau of Ocean Energy Management, Regulation and Enforcement) gives all permits for offshore oil or gas work; they are responsible for all of the oil production. USCG shares some jurisdiction -- e.g., the part having to do with ship operation, response to fire, and the USCG responds to any oil spills. OPA90 requires every facility to have a response plane. 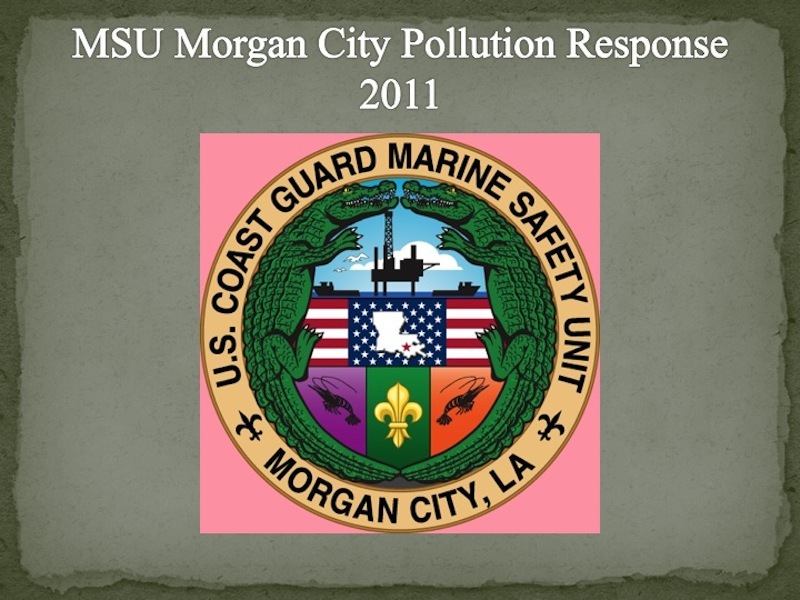 Civilian companies such as MSRC (Marine Spill Response Corporation) were formed as contractors for oil companies. MSRC is funded by some of the majors (Exxon, etc.) to meet their response plan requirements. A FOSC Federal On-Scene Coordinator (FOSC) is designated by the EPA or USCG for a particular area. Here in the Morgan City sector, responses are governed by Regional Response Team #6 (RRT6), which covers LA, TX, and part of AR. RRT4 covers MS, AL, and part of FL. They have pre-approval for use of dispersants, contingent on FOSC approving its use and notifying the relevant RRT. The FOSC and RRT can pre-approve a dispersant plan in a matter of a few days. 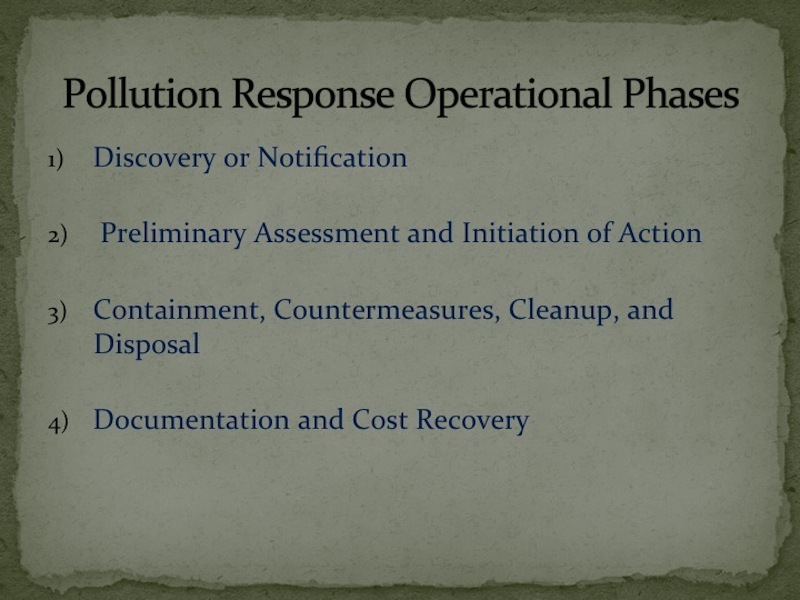 I asked about how to influence the EPA or USCG in their choices of response to oil spills, e.g., how does the EPA or USCG receive advice or scientific evidence regarding effects of some responses or evidence that would support one type of response over others. They said that the EPA and NOAA both have advisory groups, through which inputs could be given. RRT members are not voted by the public, they are designated by the EPA, NOAA, and the USCG. I was told that the members of these advisory groups might be available on the NOAA or EPA websites. Might also want to look into identity of the EPA Support Coordinator. The main EPA office for this region is in Dallas, TX. The RRT meets in late November-early December. There is also an annual convention, being held this year in San Antonio 30 Nov - 01 Dec, held by the "Clean Gulf", which is the largest oil spill cooperative and provider of oil response equipment; it is owned by the major oil companies. c) regulatory agencies (federal, state, or local agencies on patrol). Reports should be filed with the National Response Center, which is staffed by USCG personnel 24/7/365 on telephone watch. They enter the reports into an electronic Incident Reporting Information System (IRIS), and they also immediately relay each report to the Federal On-Scene Coordinator (FOSC). 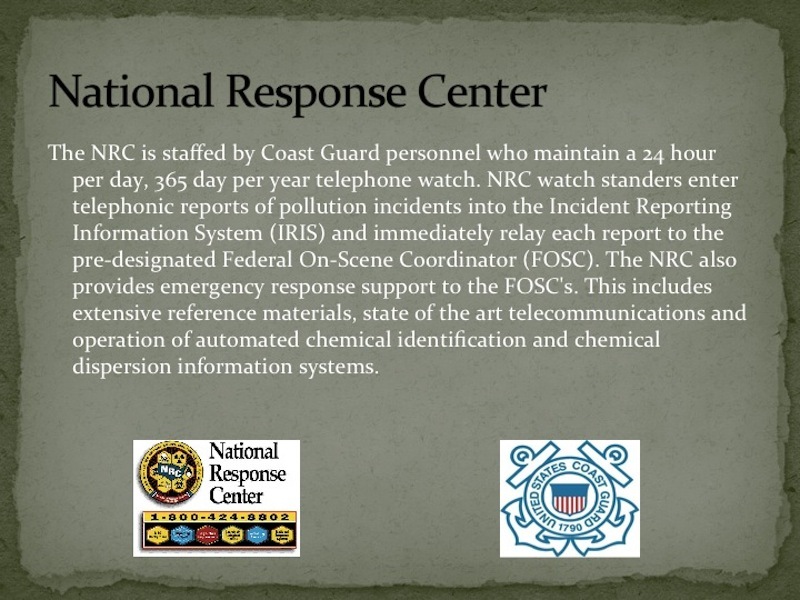 The NRC provides emergency response support to the FOSCs in the form of reference materials, telecommunications, and automated chemical identification and chemical dispersion information systems. 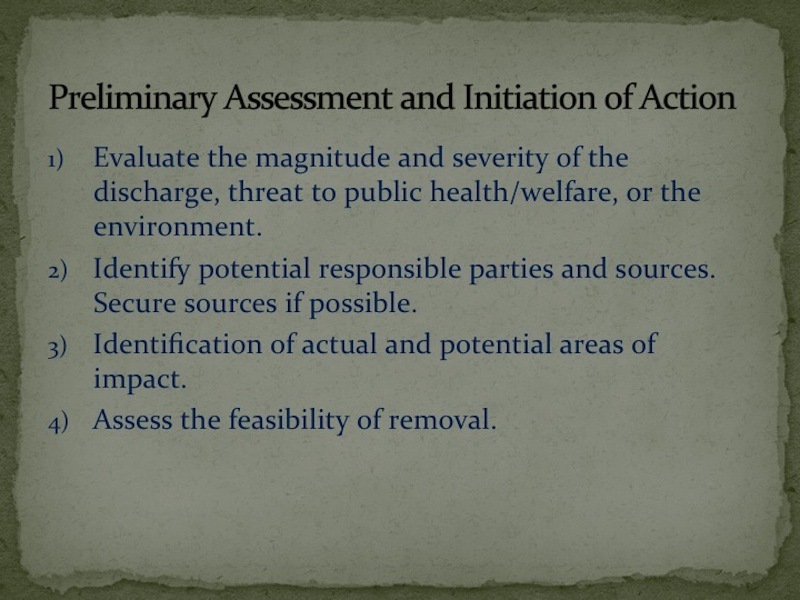 a) Evaluate the magnitude and severity of the discharge, the threat to public health and welfare or the environment. b) Identify potential responsible parties and sources, and secure those sources if possible. c) Identify actual and potential areas of impact. d) Assess the feasibility of removal. 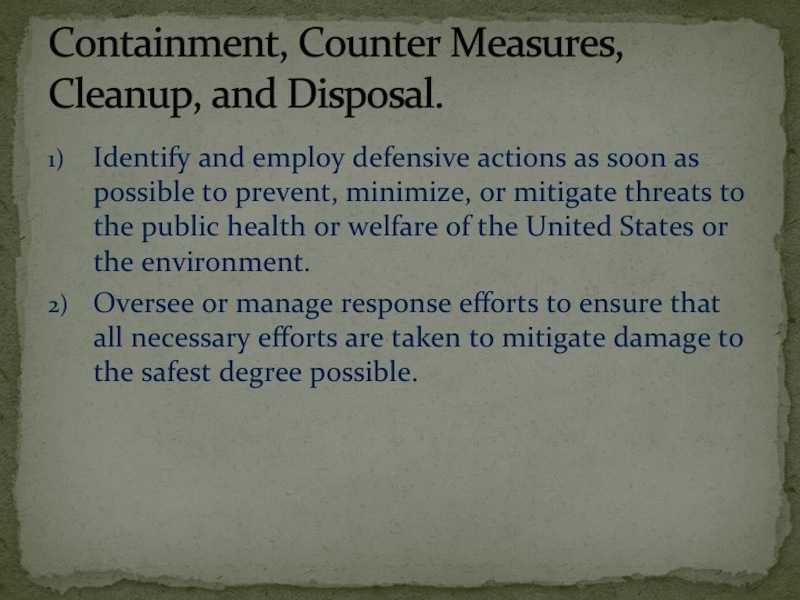 a) Identify and employ defensive actions as soon as possible to prevent, minimize, or mitigate threats to the public health or welfare of the U.S. or the environment. b) Oversee or manage response efforts to ensure that all necessary efforts are taken to mitigate damage to the safest degree possible. 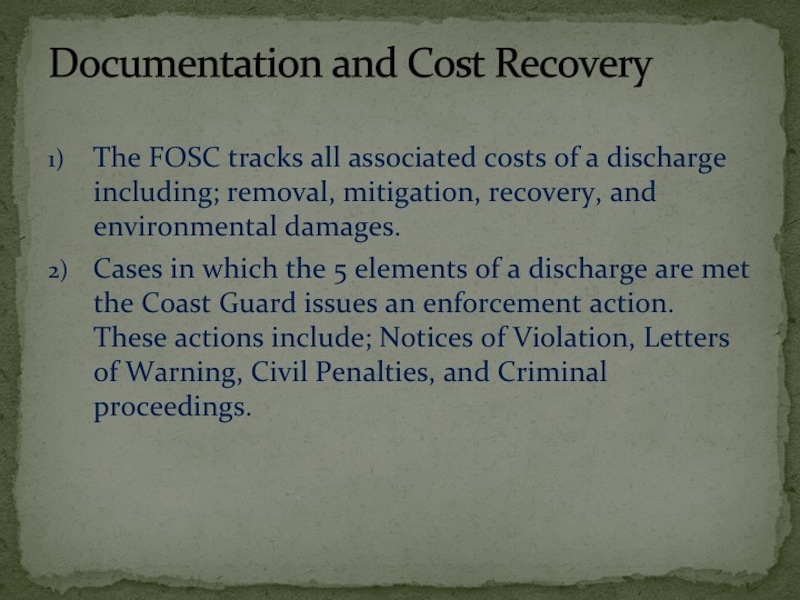 a) The FOSC tracks all associated costs of a discharge include removal, mitigation, recovery, and environmental damages. 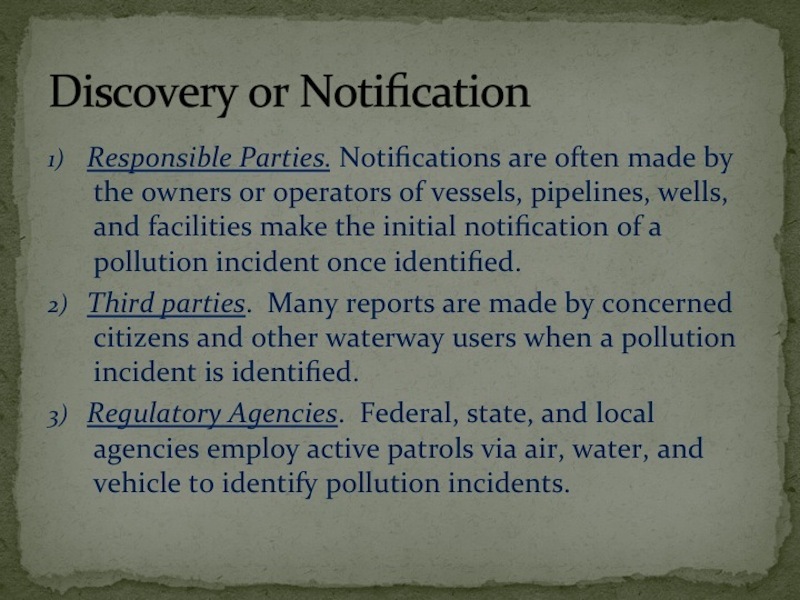 b) If all five elements of a discharge are met (see below), the USCG will issue an enforcement action. Such actions include: Notices of Violation; Letters of Warning; Civil Penalties; and Criminal proceedings. 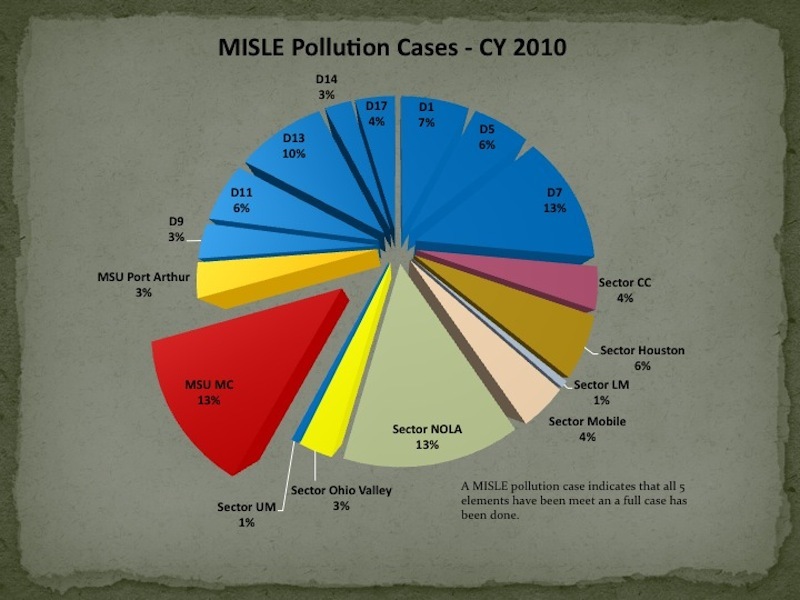 In 2010, there were 2,231 NRC reports, of which four (4) were federal projects and 372 were oil sheen of unknown origin. Of these, a whopping 13% of them were in the Morgan City sector, and another 13% were in the New Orleans sector! Other sectors such as Houston, Mobile, Port Arthur, etc. comprised 3-6 % of the total incident reports. That means that about 25% of all reported incidents in the U.S. are coming from the Gulf of Mexico off the coast of Louisiana. 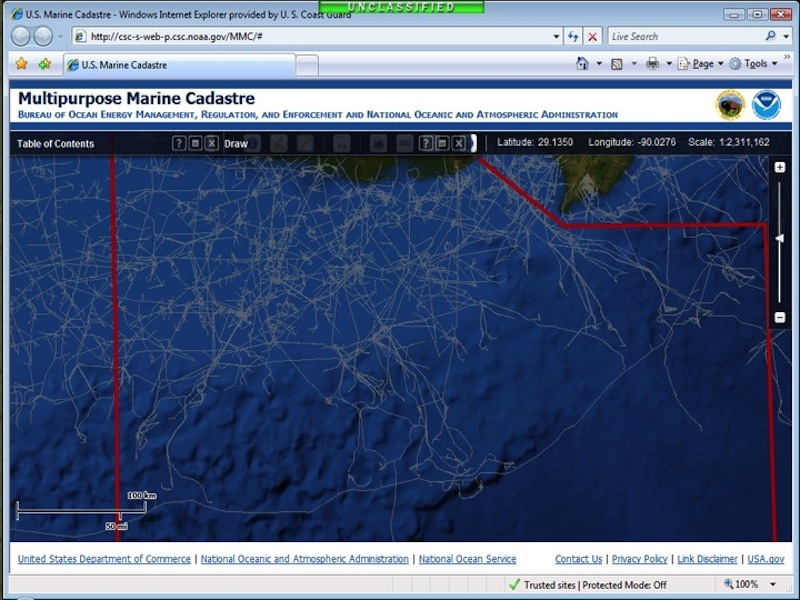 We then saw some maps of platforms and pipelines in the waters off of Louisiana. I was told that these maps are not complete, that there are many older pipelines that are not well known or recorded. a) Make the reports as soon as possible after noticing the slick (or other hazard). 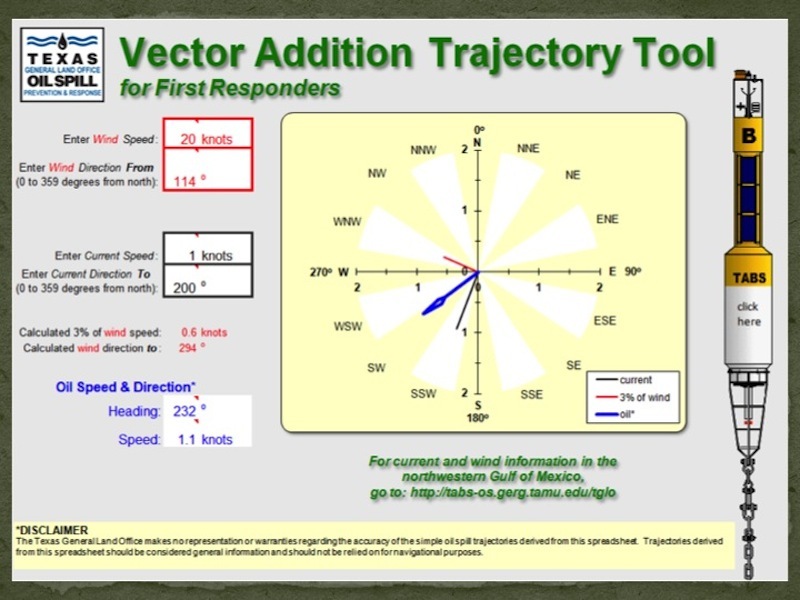 b) Give accurate position information (lat/long). TWO gps readings are preferred if possible, from each end point. c) Give complete contact information for the reporting person(s). d) Give an accurate description of what we saw and use common terminology (summarized below). e) Be aware of natural phenomena that can imitate oil slicks, such as kelp beds, jellyfish, red tide, herring spawn, natural water depth change lines, an cloud shadows on the water. Try not to give false reports. 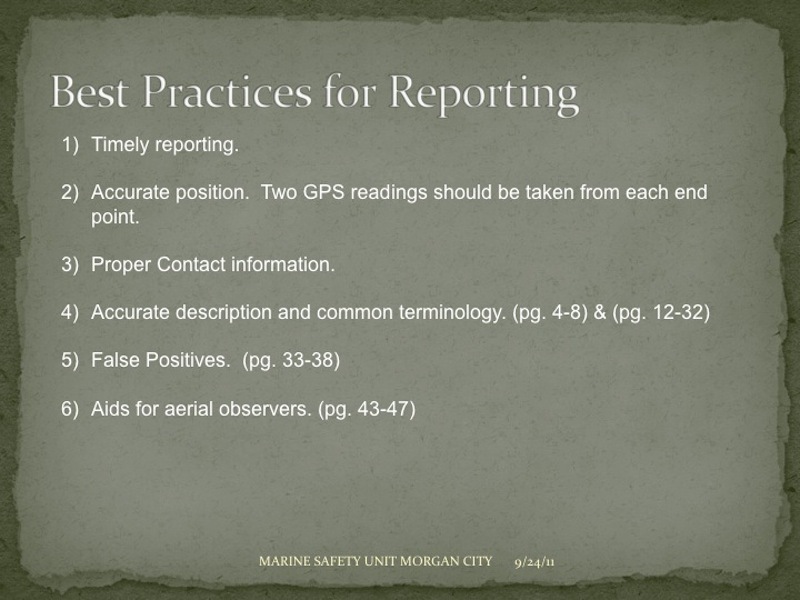 f) Note some aids to aerial observing and reporting, summarized below. a. SHEEN (thin surface layer less than 5 micron = 0.2 thousandths of an inch): Rainbow = thicker sheen, silver/gray = thinner sheen, almost transparent = thinnest sheen. b. METALLIC: Thicker than rainbow, looks like a mirror to the sky, color between light gray and dull brown. c. TRANSITIONAL COLOR: Thicker than metallic, almost as dark as oil's true color. At this thickness, which is a few thousandths of an inch, or a few tens of microns, it can still look patchy but is just thick enough to look like its true color. d. TRUE COLOR: Thicker than 0.01 inch or 0.1 mm, dark in color. In the warm waters of the Gulf, unless the oil is heavily weathered or emulsified, it probably would reach equilibrium and not be thicker than a few millimeters. a. STREAMERS: Narrow bands or lines (sheens, dark, or emulsified) with cleaner water between. Can be caused by wind or currents, but different from wind rows. b. CONVERGENCE LINE: Long narrow band of oil (or other matter) caused by the convergence of two bodies of water with different temperature or salinity, or by currents that converge due to density differences or large depth changes. c. WIND ROWS: Multiple bands or streaks of oil (sheens, dark, or mousse) that line up parallel with the wind, often including seaweed, foam, and other organic matter. Caused by a series of counter-rotating vortices in the surface layers that produce alternating convergent and divergent zones (Irving Langmuir, 1938), these can form whenever the wind speeds are greater than about 6 kts. 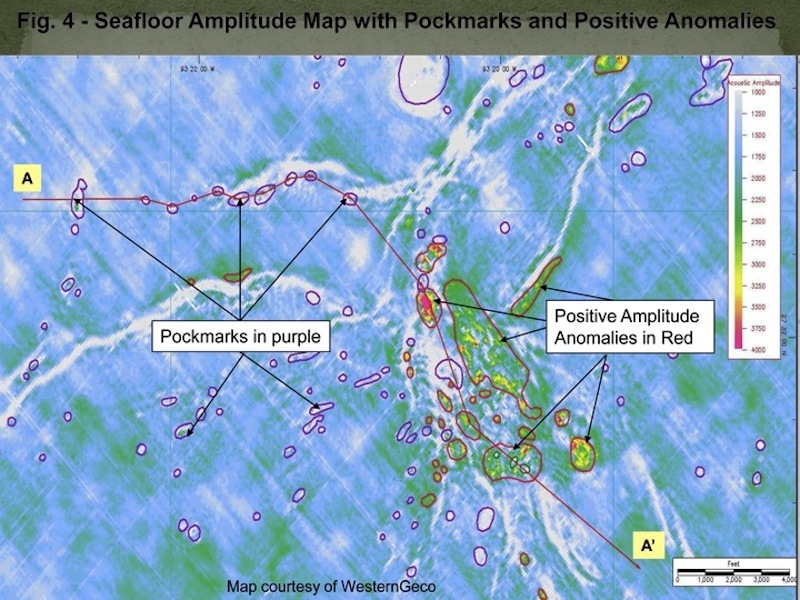 d. PATCHES: Not quite big enough to be a continuous slick, when combined with sediment or plants could be "tarmats", typically ranging in horizontal size from tens of cm to 100s of meters across. e. TARBALLS: Discrete, usually pliable globules of weathered oil, might be mostly oil or might be mixed with debris or sediment. Vary in size from millimeters to tens of centimeters across. Sheen may or may not be present, depending on how weathered (hardened) the outer layer of the tarball is. f. NO STRUCTURE: Random eddies or swirls of oil of any thickness. Usually occurs when there are only very light winds or currents. a. BLACK OIL: Black or very dark brown layer of oil. (Can't tell thickness from the air very well.) 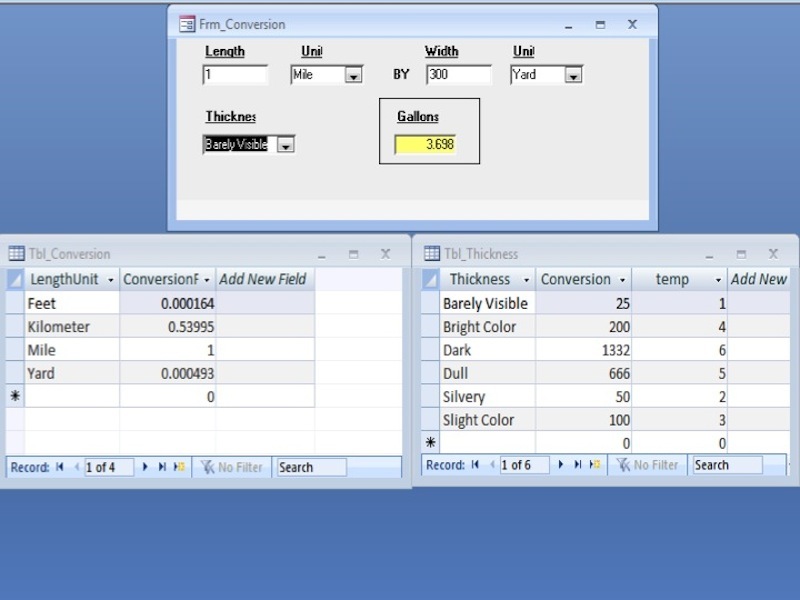 Minimum thickness for a continuous black oil layer is about 0.01 in or a few tenths of a mm. b. 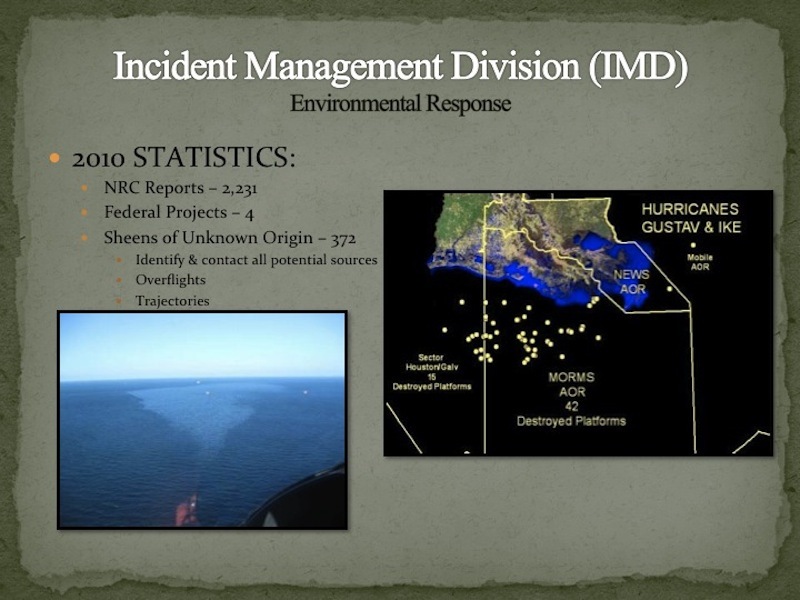 DISPERSED: Can occur from sea surface turbulence or application of chemical dispersants. The oil slick is broken up into small droplets that mix into the water column -- when oil is dispersed, the droplets are too small to refloat back to the surface. c. EMULSIFIED: Water-in-oil mixture. Typically occurs only under high-energy conditions (winds and waves). Also called "mousse". Increases the volume and viscosity of oil, so renders cleanup more difficult. 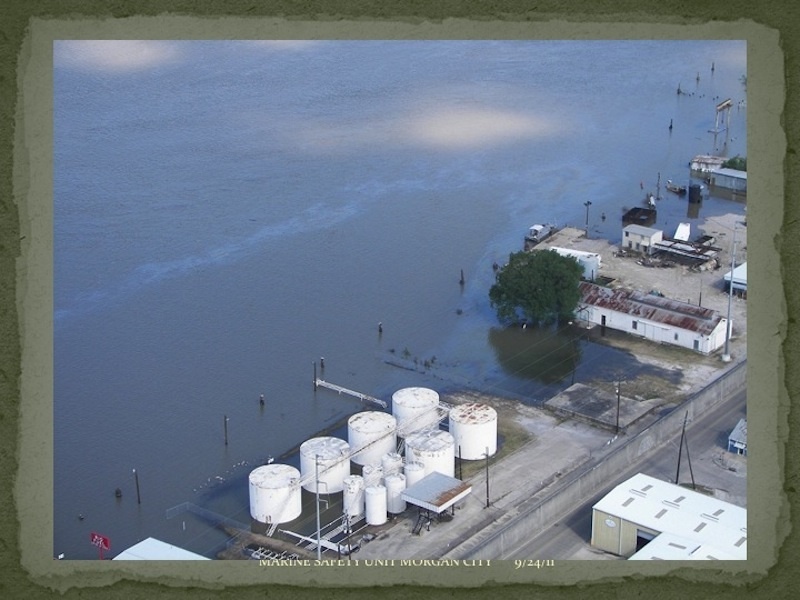 d. ENTRAINED: Oil that has been pulled under a containment boom by a strong current. Occurs when boom is deployed perpendicular to a current greater than 0.75kt. 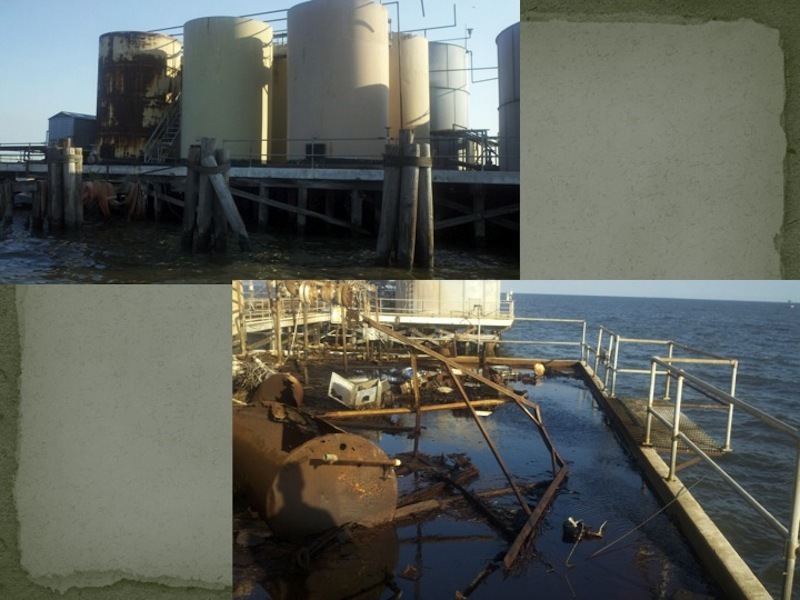 e. RECOVERABLE: Surface oil thick enough to be recovered with skimmers. Metallic or darker, or mousse, qualify. Thinner films may be recoverable with sorbents, or concentrated with booms or "chemical herders". f. SLICK: Oil on the water surface absorbs energy and dampens out the surface waves, making the surface appear smoother or "slicker" than the surrounding water. Slicks occur with oil layers thicker than rainbow or metallic. Natural slicks can occur from plants or animals. g. WEATHERED: Evaporated, dissolved, dispersed, photo-oxidized, or emulsified oil, thus changed in its physical properties and composition. Note on taking photos or video: Avoid midday light to minimize reflection, do not shoot into the sun, get lat/long for your photos or video, go farther to be sure there is not more oil beyond. Here is a photo gallery of the slides presented by the US Coast Guard at our meeting on September 13.